This pair would love to stay together, they are now 7 years old and litter mates. Sadly their owners are experiencing health issues and life for the girls is now confined to their home as the owner isnt well enough to take the girls out. Both dogs are friendly to visitors and will sit nicely for a treat. 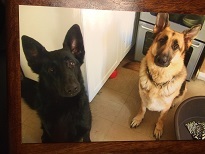 However as they have been together all their lives they arent very well socialised out and about and will require further training to get back into a routine of walks. If you feel you could help keep this pair of siblings together please get in touch as soon as possible as their owner really isnt able to give them the life they once had.